Having completed Paris-Brest-Paris twice, in 1999 and 2003, the preparation for the 2007 edition started in the autumn of 2006. This time my goal was to improve again my previous times (88 hours in 1999, 65 hours in 2003), preferably to get it below 60 hours. Because of the many climbs, about 10000 altimeters, I was thinking of buying a lighter recumbent. But also one that was a bit higher than my low racer, because of visibility while commuting. At Cycle Vision 2006 Bram Moens luckily came up with the M5 Carbon High Racer. A light and stiff high racer, but still not entirely developed into its final setup. During the autumn break I took a short test ride and was instantly done for this bike. It was not until six months later - when I had already sold and had to ride the 200k qualifier on an upright � that my M5 High Racer was ready. With only one week to spare to get my legs used to the recumbent position again, I rode the 300k qualifier in 10,5 hours. In order to get myself prepared for the hills during PBP I even cycled an extra 300k qualifier and I didn't ride the 600k qualifier in the polders of Holland but in the hills of the Ardennes of Belgium. On vacation in Provence, I prepared myself by cycling the Mt. Ventoux 3 times (3 different routes) within 5 days. During one of the descents this bike proved to be very fast; at the speed of 94 km / h I thought it would be more sensible to pull the brakes, so I did. So the preparation was top and I really felt like sniffing the atmosphere of PBP this year. I was looking forward to the thousands of spectators lined up along the route and villages filled up with cycling fanatics. En route they were offering coffee, crepes, water etc. and most of the villages were decorated with flower-dotted cycles hanging over the streets. Now in 2007, the weather decided to give us a hard time. It proved to be different already on the campsite: mud clogging on cars, flooded streets, but most of all: the bikes weren't shiny at all. To make matters worse; I got all stuffed up. That is, just like the weather, not according to plan! At the start, it was cold (at night sometimes only 12 degrees) and there was a lot of wind. Later on, there was rain, rain and further rain. As I started in the last group on Tuesday morning I was able to attend the main start of the biggest crowds. At 04:45, the scheduled start time, our group, velós speciaux, was still listening to the road safety speech of the organization. Finally, after 10 long minutes, I was able to give in to my long desire to cycle PBP and after 15 kms the pace car left us. Now it was up to us to prove that we could cope with PBP and its circumstances and distance. My heart rate monitor was my main guide for pacing myself. For the connoisseurs: basically in the base endurance zone and uphill in the D1 zone. This allowed me to keep a good cruising speed for a long time. Soon I passed two Questen (Gerrit Schotman and Peter de Rond), and even a fast looking M5 Low Racer with tail fairing and disc wheels (Bernhard Böhler). This gave me a boost, but I had to pace myself otherwise I would have gone too fast. Around km 140 the terrain was moderately hilly and I finally started to get warmed up. This was necessary because there was a fairly strong head wind. Later on the wind shifted from west to east. After the cold and rain also Aeolus (the Keeper of the Winds) is not favorable disposed to me. The first stop is scheduled in Mortagne. Here it came down to a rapid change of my Camel bag and taking the bars, bananas etc. My father and brother played a crucial role in this. Everything went like clockwork and the next checkpoint was "only" 80 kilometers away in Villaines-la-Juhel. At this stage I already started to overtake cyclists who started 8 hours earlier: they were cycling pretty slow and they might not be able to finish within the time limit. These riders were a good target for me and it really motivated me if I overtook one. With great speed I cycled up and down the hills; no one overtook me that day and it seemed as if I had wings! After another 80 kilometers my 'team' was ready to give me a quick supply of fluids and food. The amount of water was adjusted downwards due to the cold weather. And with regards to the pee breaks: next time I should figure out how to do this while cycling. This will save me, in total, two hours. Maybe a urine catheter next time?! You are flying, keep it up. Only focus on the next rider to catch. Breathe, spin, go! Coming into the vicinity of Loudeac, there was a good motivational sign along the side: "Brest 200 km, 800 km Paris"
It became dark in the meantime, which meant that I really needed my front light to find the arrows in the dark. This did not really greased the wheels as it was apparent that every course was plotted by a different person and ditto strategy. Sometimes I was really searching for the right direction: riding slowly to check for arrows and get moving again. Somewhere between Loudeac and Carhaix, the leading peleton was approaching me. The support car quickly dipped its head lights before they blinded me. And approximately 1.5 hours later I came across two other fast men (Ymte and Hans) in their velomobiles. At that moment I realized that I missed my English cycling buddy Ben: occasionally a chat but just as important: his slipstream. Hans and Ymte have the better as far as that is concerned. Between Carhaix (526 km) and Brest (615 km), near Huelgoat, I cycled through a dark wood with a roof of dens foliage. This was where my big wheels showed their strength: despite the rough asphalt: they had no problem to keep on rolling. At the same stage I encountered the Roc Trevezel, a hill of 380 ms in the middle of the landscape, completely wrapped in shrouds of thick fog and pretty cold as well. The fog was so thick that I found it difficult to distinguish the arrows and had to dismount my bike. Even the descent is not a bit of funny. But Brest ogled and as I descried the contours of the Albert Louppe bridge I realized: "Halfway, only another 610 kms!" In Brest I tried to powernap for 30 mins in the front seat of the car, but as the adrenaline rushed through my veins I did not succeed. It was now quite clear that I could not maintain the 50 hours fast schedule and I changed tack to a finishing time between 50 and 60 hours. Do not get distracted. Keep hydrated it's humid. Go! In retrospect, something terrible happened to me in Carhaix. At the roundabout, in front of the checkpoint, a French car is stopped by a volunteer, but as I cycled in front of this car it moved on. I was scared stiff, braked heavily and fell over and landed on my Tail Bag. Fortunately, I could quickly put one foot on the ground. The car drove away, and I just thought about the time I would have lost if I had dealt with the driver. Because of the wet weather, the skin of my feet became soft and it burned terrible, a sort of trench foot? I greased my skin nicely with ointment and, to give my feet some relief, wore my flip-flops to the checkpoint. Until long after the accident I imagined that my front beam was bent or my frame was out of line, but that is impossible as the frame is a carbon fiber construction. Still, I checked my frame numerous times for cracks and did not descent as rapid as before. This, together with the wind and showers of rain, cost me a lot of time. Focus on your breathing. Go! This message gave me a real boost. The checkpoint in Dreux was a dull business; not many cyclists were arriving. I was totally fed up with PBP and wanted to finish the whole thing ASAP and started thinking I'll never do it again. In Dreux I bumped into Perry Stoel, the other cyclist on a M5 Carbon High Racer, together we cycled out of Dreux over countless winding roads which took us more than 45 minutes. But the weather was improving: no rain anymore and even some sun rays. I left Perry and pulled of some extra layers but I stood with one shoe in a small puddle of mud. One of my cleats got totally stuck with mud and I could not release the shoe from my pedal. I dismount my recumbent and more than 30 minutes later the cleat is ready for the last kms. My only aim was to finish within 58 hours. The numerous steep climbs, many traffic lights in the suburbs and being stopped by a police squad as I ignored a red light put a spoke in my wheel. Still better than number 0432, who was carried away in an ambulance before my eyes. I took some time to speak to the policeman and wrote down the participant number. Keep concentrating Tijmen: under any circumstances will I avoid such a flop. Eventually I arrive, under loud applause, on the big roundabout. I swap my card after 58:02. Just missed my goal of 58 hours, but didn't we start ten minutes too late?! I have got sense of satisfaction after the achievement of my goal, even though it could have been a sharper time with the knowledge that I now have. I am pleased with the new bike and its configuration: stiff, fast and light. The support from my team (my father and brother) was perfect and also a necessity when you want to cycle fast. In front of the video camera I had promised to stay away from Paris-Brest-Paris forever. But heck, wasn't I extremely tired, sleep deprived and satisfied with the result�.. Weeks later more euphoria follows: 10 minutes were deducted from my finishing time: 57 hours and 52 minutes!! After sifting out the final results it appeared that I was the first unfaired recumbent. Not bad for a now 40-year-old man. As I don't want to wait another 4 years for such a challenge I am eager to enter London-Edinburgh-London (1400 km) in 2009. Is this sensible? We'll see. For those who would like to get an idea of how I was doing in PBP 2007: There is a DVD in the pipeline. My brother has made a film, out of professional interest. This DVD can be ordered by contacting us via: tin.hoeve@orange.nl. From Friday October 21 to Monday October 24 M5 Recumbents has a stand at the Bike Motion show in de Jaarbeurs in Utrecht (Netherlands). Standnumber 7E017. The Monday is merchants only. 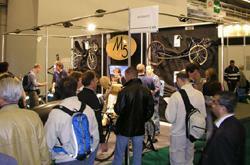 The interest of the visitors for the M5 stand on the Salon du Cycle 2005 was extensive. Not only the M5 bikes received a lot of attention, but also the charactiristic pose of the two dummies (second small picture). One in a completely relaxed position on a Low Racer, the other in the familiair painful posture on a conventional racing bike. Last of the small pictures: our view on the Paris Bikefashionshow.